Start your online store today, powered by our fast, stable and ultra-secure hosting platform + your choice of e-commerce solution! Magento is an ecommerce platform built on open source technology which provides online merchants with a flexible shopping cart system. PrestaShop is professional e-Commerce shopping cart software, built to take advantage of essential Web 2.0 innovations. WooCommerce lets you sell products and services from your WordPress site. It's a free plugin, and is currently the most popular eCommerce platform on the web, powering over 28% of online stores. OpenCart is an open source PHP-based online shopping cart, designed feature rich, easy to use, search engine friendly and with a visually appealing interface. AbanteCart is a free PHP based eCommerce solution for merchants to provide ability creating online business and sell products online quick and efficient. Odoo is an all-in-one solution that combines CRM, website/e-commerce, billing, accounting, manufacturing, warehouse, management, project and inventory management. None of these eCommerce solutions fit the bill? Never fear, view the complete list of all 35 eCommerce solutions, all 100% compatible with our hosting service. Our prices may be cheap, but we're not selling cheap hosting. Our eCommerce hosting plans are bursting at the seams with features you'll love, all backed by fast 24/7 support and powered entirely by renewable energy. Existing sites? We'll migrate them for you. No hassle, no wasted time and no headaches. If your host is letting you down, we'd love to welcome you. Find out more. Install applications including WordPress, Drupal, Joomla and over 400 others in a click. You're also able to backup, upgrade and clone your installations. There are a huge number of eCommerce solutions available. Every application below is 100% compatible with our hosting. osCommerce is an online shop e-commerce solution that offers a wide range of out-of-the-box features. Open eShop is a PHP script which allows you to start selling any digital good, like MP3, eBooks, Movies, Software or any Service you offer. Putting the dream of online business ownership within reach of anyone! Loaded Commerce is a responsive ecommerce web application. thirty bees is a state of the art e-commerce platform that empowers users to easily start and maintain an e-commerce. LiteCart is a new innovative free shopping cart platform developed in PHP. X-Cart is a PHP/MySQL based secure shopping cart software with open source code. Avactis offers an extremely convenient set of tools to quickly launch an online business. Simple and functional shopping cart for you and your customers. Simple Invoices focuses on the basic needs of invoicing yet gives users advanced flexibility without compromising simplicity. Open Source Point of Sale is a point of sale system built on top of a CodeIgniter base. With Invoice Ninja, you can easily build and send beautiful invoices from any device that has access to the web. Blesta is a well written, secure, user and developer friendly client management, billing, and support application. InvoicePlane is a self-hosted open source application for managing your quotes, invoices, clients and payments. Arastta is a Free and Open Source project with contributors from all over the world. Alegro Cart is a free open source e-commerce shopping cart solution based on MVC Framework. Axis Commerce is a powerful open source e-commerce platform. Zeuscart is an incredibly stable & richly-interfaced, open source shopping cart. Thelia E-commerce solution based on Symfony 2. SeoToaster E-commerce is the most advanced SEO CMS & Ecommerce web site builder. Shopware is a highly flexible, powerful and customizable solution that allows you to quickly and easily create an online shop, regardless of its requirements. Logic Invoice is an accounting & invoicing solution, which you can use to build websites and online applications. osCmax is a powerful e-commerce/shopping cart web application. EC-CUBE is an all-in-one shopping cart suite. PEEL SHOPPING is a free e-commerce CMS, that lets you manage your product catalog and the look of your website from a simple and efficient administrative interface. Maian Cart a FREE php e-commerce system for personal or business use. We're serious about uptime. And we mean REALLY serious. 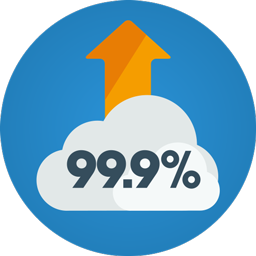 Thanks to our extremely geeky server stabilisation and security technology, you'll find that 100% uptime is a regular occurrence. If we do ever fall below 99.9% in any calendar month, we'll credit you. It's that simple.